Mayo, FL--The Fellow Travelers traditionally schedule an easy paddle for the Friday and Saturday following Thanksgiving. Plans were made to put in at the SR 51 bridge at Luraville, canoe to the Suwannee River Management District’s brand-new campground at the Adams tract on Friday, and to continue to Branford on Saturday. 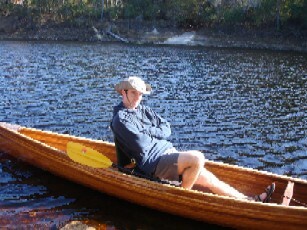 Charlie Stines made the needed reservations and was set to gather the travelers for the paddle. A few days before the e vent Charlie received a call informing him the campground was not quite ready and alternate plans would have to be made. 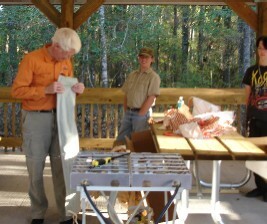 The plans were changed to put in at Ezell Landing, canoe to the Peacock Slough campground, and take out at Royal Springs on Friday which was a re-run of the Memorial Day weekend trip. The crowd gathered on time. By the time of the trip the number had dwindled to thirteen, but it was a fine crowd. Roy Moye brought his clan--Eric, David, Justin, and Nathan. John and Jay Williams brought Jeanne Hewetson and spent Thursday night at Lafayette Blue Springs. Art and Janice Shelfer came. Diane and Charlie Stines brought the knave, Tim Eidson, to complete the baker’s dozen. Diane also brought her Yorkie, Ami, so she would have at least one agreeable companion. 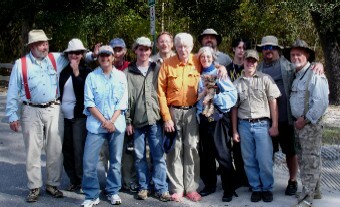 Jerry and Donna Ellis had to cancel paddling but did meet the group at the put-in and shuttled the drivers to Peacock Slough. 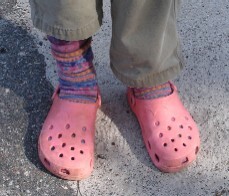 Donna gifted the King with a colorful pair of warm socks to complement his pink river shoes which were a gift from the mayor, Greg Baker. Once the vehicles were shuttled the canoes set off for the journey. A paddle across the river revealed mostly mud where Charles Spring is at better water levels. God has smiled upon the Fellow Travelers at Thanksgiving--some might say He has laughed--by blessing them with pleasant weather. This year was no exception. The skies were blue and the cumulus clouds were like cotton candy. Although northern Florida’s autumn colors can not rival those of the more northern climes, the hardwoods were at their peak. The reds, yellows, and purples of the trees reflecting in the black waters of the Suwannee was a memorable sight. Wildlife observed mostly consisted of ducks, turtles, hawks, herons, ibises, woodpeckers, and songbirds. The trip required no particular speed and none was attempted. Paddling got off to a humorous start when Jay fell out of his solo canoe to avoid actually upsetting. But the water was shallow and the temperature was not cold. He had no reason to panic and he did not. The first stop was at Lafayette Blue Springs State Park, also known as Yana Springs. There w as a lot of construction there as the park is getting cabins ready. The spring itself consists of two pools separated by a natural bridge and surrounded by high banks. The spring churns a vigorous flow into the river even at the low water levels. No one went swimming but it was a prime place to stuff snack food. After leaving the park the flotilla headed on to Perry Spring. Perry Spring is a medium-sized spring and like so many others is the site of some development. One landowner has built a grand home adjacent to the spring. The water level was low but the water was clear. After a pleasant stop and some friendly conversation the paddlers headed downstream. The next adventure was the shoals just upstream from SR 51. At high water levels the rocks are covered and there is hardly a ripple, but this time the sound of rushing waters and the sight of swift eddies presented real opportunities to crash the boats into the rocks. All who have paddled with the Fellow Travelers recognize that few in the group possess extraordinary paddling skills, but everyone handled the small rapids with ease. There were people on the bank who seemed impressed by the skillful handling exhibited. From there it was on to Telford Spring, a favorite spot. Telford is another double-pool spring and has been the gathering spot for crowds. Unfortunately, the crowds often left more than a trace of litter. The surrounding area is now posted, but there is still a public boat ramp next to the spring. It was a short stop. The water was exceptionally low. 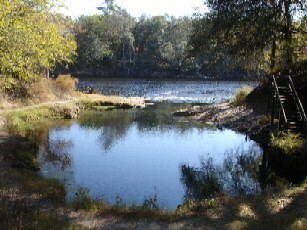 It is a relatively short paddle from Telford to the Suwannee River Management Canoe Campground at Peacock Slough. The entourage was there before three in the afternoon. The campground was in excellent shape. Some pitched tents on the screened platforms and others opted to set up on the ground. Before supper was cooked John Williams and Art Shelfer presented the King with a superb major award, a Cook Partner four-burner propane stove. It was like the one used by John and Art’s outfitter on their Green River, Utah, trip. Rumor is that a lot of Fellow Travelers contributed to the gift, and it was certainly appreciated. Charlie and Diane prepared a beef stew on a turkey frier rather than on the Cook Partner. Since lying is a tradition on canoe trips several campers said the stew was good. Diane gave a more honest opinion. John cooked cornbread in his Dutch oven and Art made some kind of bread in his. Art’s bread rivaled the quality of the stew, but John’s was better. Greg Baker rode his Ural with sidecar to join in the meal. The camp host and hostess also at e. The host and hostess were so impressed that they failed to come for breakfast Saturday morning. Someone built a campfire and the gang sat around talking and lying. Frank was not there, and Charlie refrained from telling about town drunks and Jason. Toasted marshmallows brought out the kid in the largely middle-aged group. Bugs were not a problem. The cooler temperatures of the evening were warmed by the fire. Eventually all retired for the night. No one arose before daylight. Diane made about forty cups of coffee in the electric urn, and it was consumed. Several joined in breakfast preparation using the Cook Partner, but it was the usual grits, sausage, and greasy gray eggs. Biscuits were cooked (overcooked) in Dutch ovens, but they were not so burned as not to be good with the jelly. No one was in a rush to leave camp, but once the sun had warmed the air all headed downstream. The first stop was at Running Spring which to some is the prettiest spring on the Suwannee. It is no longer posted and the landowner has even placed a portable toilet there. The group spent considerable time at the various springs surrounding the main spring. Ami found it to be an enjoyable stop for a dog. The next stop was Bathtub Spring. It was almost dry but the small springs in the woods behind it still retained their deep blue clarity. From there it was on to the River Rendezvous at Convict Spring. The spring run had no water so the thirteen walked up to the spring. It was low but clear, and there were a lot of fish visible in the spring. The store and the restaurant there were closed, and probably permanently so. The reason? High waters in the distant past. It took only about forty-five minutes to from Convict Spring to reach Royal Spring, the final destination. Greg Baker met the canoeists and drove the drivers back to Peacock Slough to retrieve the vehicles. Those getting the cars were privileged to ride in Greg’s new Mercedes SUV, a vehicle he bought because he was envious of A rt’s Benz. Everyone was privileged to see Greg’s daughter, Erin Bratic. Once the canoes were loaded everyone left. Several ate at a buffet restaurant in Mayo, and the universal opinion was that Roy could have made sardines tastier than that restaurant could make shrimp, and that Roy could do it for less money. After the meal, the travelers headed in their separate directions. Tim Eidson rode with Diane and Charlie and Tim developed a pain so severe that Charlie and Diane took him to the Moultrie hospital before going home. He was diagnosed with kidney stones and was given enough pain medication to allow him to drive back to Cordele. Tim eventually had to have surgery to correct the problem. It was a good trip even though the crowd was the smallest Thanksgiving group in years.